I can’t help feeling that Bishop Gene Robinson exhibits the Irish trait of being willing to travel long distances in order to be offended! Last night’s Belfast Pride Festival/Faith and Pride screening of the film Love Free or Die at the Parish Church of St George in Belfast showed the bishop travelling to the UK to loiter around the fringes of the 2008 Lambeth Conference to which the Archbishop of Canterbury Rowan Williams had not issued him with an invitation to attend. 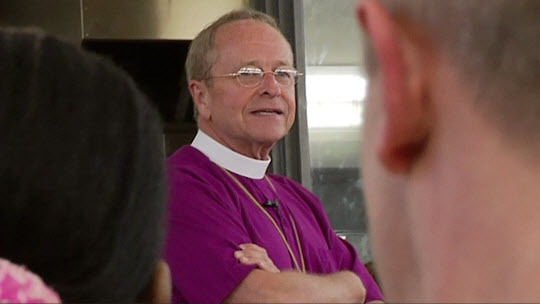 Openly gay, Gene was elected as an Episcopal (Anglican) bishop for the New Hampshire diocese in 2003. While Rowan Williams described the decennial Lambeth conference of worldwide Anglican bishops as “bishops speaking to each other in a safe place, respectfully and prayerfully”, listening to the first openly gay bishop wasn’t on his agenda. The documentary’s film crew followed Gene Robinson during the conference as he made himself available “in case any bishop wanted to take the opportunity to talk to him”. Ultimately Robinson was disappointed at how few bishops he was able to meet. During the film Robinson is seen in humdrum domestic situations as well as observing formal denominational duties, flicking from decorating his Christmas tree to visiting groups in his diocese to attending the 2009 Episcopalian Convention (which voted overwhelmingly to consecrate gay bishops and to allow church marriages in states which have legalised gay marriage) to giving the invocation (ie, praying) to open the first Obama inaugural event. While the film manages to open up the issues of prejudice and inequality, it’s not a great documentary. Love Free or Die never quite decides whether it’s a personal portrait or a campaigning documentary. Too many other intriguing figures pop up throughout the narrative, leaving the audience wanting to know more about the first female Episcopal bishop Barbara Harris, or the Episcopalian bishop who wants to stay in the denomination but wishes that “God would lift the scales off my eyes” and show him how scripture accepts homosexuality. While Robinson is seen interacting with groups of parishioners in his diocese and preaching to the First Presbyterian New York congregation (where he exhorts them to join him in the "dangerous" act of handing out water to Gay Pride marchers), the film contains few direct encounters showing Robinson in discussion with members of the public or clergy about the issue of LGBT inclusion/exclusion within the church. And the theological arguments are completely ignored. It’s a moral issue of justice. Period. By the end of the eighty minute documentary, the US Episcopal church is seen moving forward at the expense of leaving some of its brethren behind. It’s a stance that is in sharp contrast to much of the rest of the Anglican empire. A situation that looks certain to repeat itself across other denominations, with elements of the Church of Scotland and PC(USA) already putting pressure on wider Presbyterian relationships. 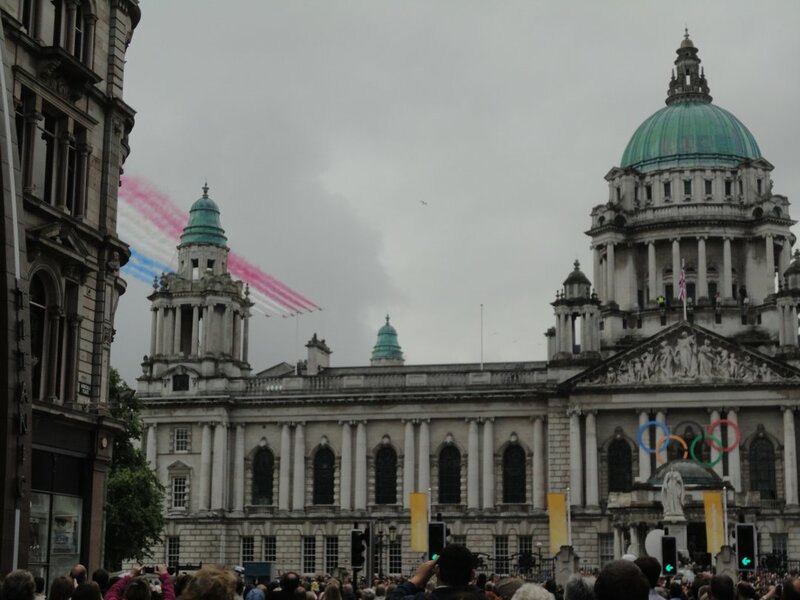 Red Arrows fly past ... Victoria Square, but not over Belfast City Hall! At lunchtime today, hundreds of people loitered in the heavy rain near the front of Belfast City Hall. Many took refuge in shop doors and shop fronts down Donegall Place. For people standing at the Burger King side of the street it was a case of all sound no picture as they heard the roar of the planes as they flew well to the east, perhaps more over Victoria Square than the City Hall! People stood around bemused, as if wondering whether the fly past had happened yet. A damp squib, but nonetheless, Belfast marking the start of the 2012 Summer Olympics in London. Don't expect to read too much on the blog about the Olympics! The big screen in the grounds of Belfast City Hall will be showing action from the Olympics and Paralympics over the next few weeks. The Red Arrows are also doing a fly-past in each of the four UK capital cities to mark the start of the Games. They will fly over City Hall, up Donegall Place and out over south Belfast at approximately 1pm on Friday. The opening ceremony promises to be a spectacular occasion as we look forward to a summer of sport with the Olympics and Paralympic Games. Those coming along to Friday`s celebrations at City Hall will also be able to take part in an Olympic sing-along as part of the opening ceremony, with song sheets being provided. There will be daily coverage of the Olympics on the big screen until 10pm or 11pm as local athletes including Alan Campbell (rowing), Peter and Richard Chambers (rowing), Wendy Houvenaghel (cycling), Paddy Barnes (boxing), Michael Conlan (boxing) and Lisa Kearney (judo) compete. Belfast Pride Festival starts this weekend, leading up to the the parade through Belfast city centre on Saturday 4 August. 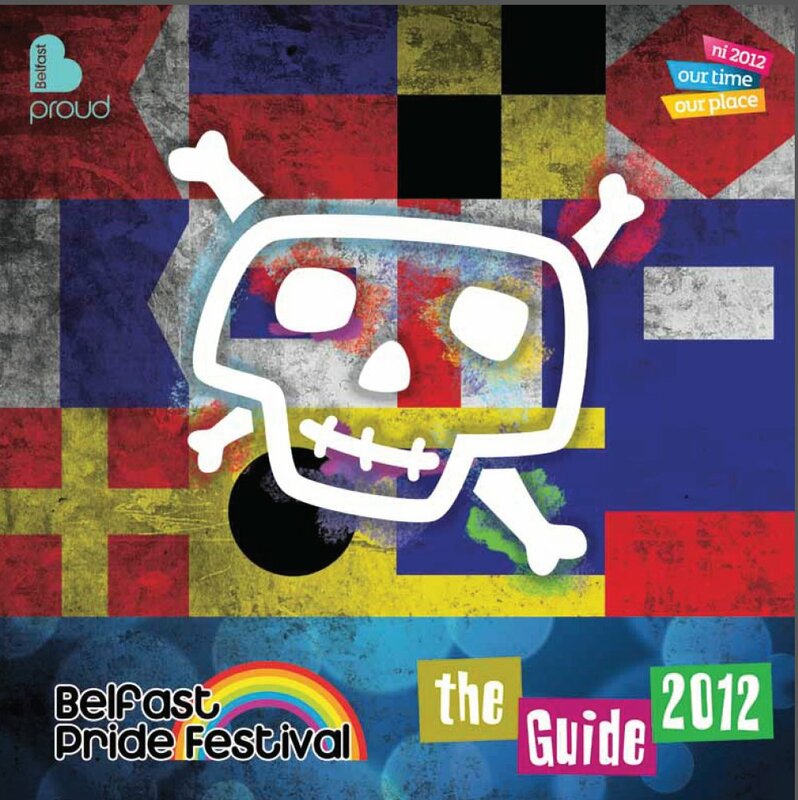 While Christian groups may sometimes be best known for protesting at the parade, there are many faith-based events in the Belfast Pride programme (augmented by the Faith and Pride group and others). Sunday 29 July at 4pm // All Souls' Church, Elmwood Avenue // Discussion about the right to gay marriage. Sunday 29 July to Saturday 4 August at 6pm // St Georges Church, High Street // Daily fifteen minute services of prayer and reflection with speakers from a range of traditions. Sunday 29 July at 7pm // St Georges Church, High Street // The service of reflection at 6pm will be followed by a screening of Love Free or Die following Bishop Gene Robinson as he travelled from Washington to Lambeth calling for people to stand for equality. Monday 30 July at 7.30pm // Europa Hotel // Amnesty Pride Lecture 2012: The Dangerous World of Gay ‘Cures’. In 2010 journalist Patrick Strudwick published “The Ex-Gay Files: The Bizarre World of Gay-to-Straight Conversion” in The Independent, chronicling a year of undercover investigation of therapists claiming to be able to ‘convert’ gays and lesbians to heterosexuality. In some countries, ‘gay conversion therapy’ is used as a form of punishment amounting to torture against gay people. Strudwick’s exposé shone a spotlight on the activities of therapists such as Dr Paul Miller, a psychiatrist and adviser to a former Northern Ireland MP. Following Strudwick’s investigation, the British Medical Association passed a motion condemning attempts to change a patient’s sexual orientation, while Dr Miller was sanctioned by the General Medical Council, who imposed conditions upon his practice. Strudwick will speak about his investigation into ‘gay conversion therapy’ and how that is used here and across the world as an attempt to negate gay identity and human rights for gay people. Hosted by William Crawley. Tuesday 31 July at 6pm // Europa Hotel // Pride Talks Back 2012. Not strictly faith based, but politics in Northern Ireland is never far away from religion! Panellists from all five main parties will be answering questions from the audience. For the first year, the DUP have volunteered an elected representative for the panel: Belfast’s Lord Mayor Gavin Robinson will join other well known politicians. Chaired by William Crawley. Wednesday 1 August at 7pm // Europa Hotel // Hymn or Us will take a theme of Faith in Education and debate issues with leading religious leaders and educational experts. Chaired by the ubiquitous William Crawley. Saturday 4 August at noon // Belfast Pride Parade // The largest cross community carnival parade in Belfast (10,000+) is taking a nautical theme this year. It leaves Custom House Square at noon and snakes its way past the City Hall and down Castle Place before returning to the square. Music kicks off at 1.30pm while there’s family entertainment (a lot less rowdy) across the road beside the Big Fish. Rather than walking in the parade, several Christian groups are planning an anti-protest! They'll be "standing on High Street, behind a Faith and Pride banner, holding pro-gay signs and cheering the parade on". The organisers hope that "participants in the parade will then see our message of accepting, inclusive Christianity where love is love, regardless of gender". See Faith and Pride website for details. Everyone is warmly invited to attend, and will be made welcome, regardless of their orientation, gender or faith. Sunday 5 August at 5pm // Europa Hotel // Queer Generations: Personal Perspectives on the past, present and future. Liam Clarke, Belfast Telegraph Political Editor, hosts a debate and discussion between older and younger members of the LGBT community, charting highs and lows, ups and downs of Gay Liberation in Northern Ireland. Phil O'Kane has also posted a guide to Pride events on his Iced Coffee blog. Nesta have announced the ten Destination Local projects that they’ll be funding – to the tune of £50,000 each – to roll out hyperlocal platforms and services (rather than just encourage content creation). Other players, such as Talk About Local, do a great job helping to establish, train and support publishers. We wanted instead to support the creation of new platforms and services - especially for mobile devices that are aware and responsive to location. By doing this, Nesta and its partners want to encourage innovation to generate some public knowledge about what works and what doesn't work and what the challenges will be as new forms of mobile consumption develop. Locali in Craigavon were one of the successful entrants. I’m trying to find contact details for Locali and will post more about their pitch and plans if and when I get in touch with them. In the meantime, here’s their two minute video and blurb. Locali will interact with the community, local council and local businesses to facilitate improved local engagement through a location-aware smartphone app. The app will provide hyperlocal news and information - streamlining existing public information together with new hyperlocal content. It will also allow citizens to feedback issues directly to the local council. Printing national newspapers in Northern Ireland comes at a cost. Rather than using a handful of print centres to cover the whole of Great Britain and relying on good distribution network over road/rail, the Irish Sea gets in the way and a local printer has to be found to produce a much smaller print run for the diminutive Northern Ireland market. In the past, the capability of local printers has meant that while the format of the Guardian changed to full-colour Berliner, the newspaper reviews page was omitted from the G2 insert in Northern Ireland. When the Independent went full colour in September 2008, the Northern Ireland version took a while to catch up, leaving some photographs spanning the centre spread, one half in colour, the other in black and white. In the case of the Indy – the smallest of the main UK national daily newspapers with a circulation of a mere 105,000 (compared with the Sun's circulation of around 2,500,000) – they can't need more than a couple of thousand copies printed in Northern Ireland and distributed each night. The full edition of The Independent will cease printing in the Republic of Ireland and Northern Ireland on 1 July. This decision has been made in the light of the extremely high costs of printing and distributing so few copies in Ireland. However, we are happy to be able to offer our readers in Ireland a wide range of alternative ways to access The Independent content. Readers in Ireland can continue to access The Independent through the i newspaper, The Independent on iPad, The Independent's smartphone app or online at independent.co.uk. One Independent columnist noted that he'd no longer be able to see his own material in print! While it won’t sound the death knell for media plurality, it does reduce the choice of news outlets available in Northern Ireland. It seems unthinkable that while the Independent was part of Independent News & Media it would have exited the Northern Ireland market. Could the Independent eventually withdraw from other localities: Scotland, Wales, or anywhere outside the M25? With the Guardian only on double the circulation of the Independent (216,000) will it too pull out of Northern Ireland within the next couple of years? The more popular and smaller 20p i is still expected to be printed each morning and be on sale in Northern Ireland. In the meantime, Northern Ireland will no doubt continue to provide the Independent with lots of stories.